Will going open source and adding new resources make Swift even more popular? Yesterday was a big day for Swift developers – Apple announced the open source release of the Swift language. There’s a new home for this initiative, Swift.org, and the complete source for the language is up on GitHub: https://github.com/apple/swift. By open sourcing Swift, Apple has really broadened the environments where Swift can be used. You could now consider using Swift on the server, which is a powerful combination if you’re already using Swift in your mobile application. Having one language for both the front end and back end is pretty darn compelling! Make sure you use the drop down on the upper left side to try out the different samples. I missed that at first. 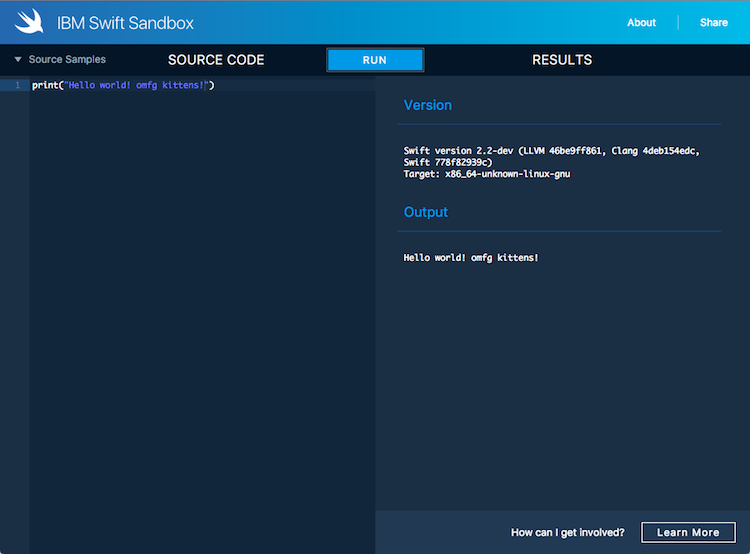 XCode itself provides a way to test code, but I found this web-based sandbox a lot easier to use. In 2016, I plan on focusing on two things – Node.js and Swift. I had already planned on this before the announcement, but this move by Apple just cements my choice.